We are packed tight in a side-room of Reykjavik’s only tiki bar, coats shrugged off, shuffling for a view among strangers in gray, black and blue, the understated fashion of Reykjavik and northern Europe. The crowd is serious in the Nordic sense, reserved and quietly intense—and from their still, anticipatory posture, clearly into the music. The Swedish trio Hey Elbow—a guitarist/singer, trumpet player and drummer—starts into their set and then into the booming open chords of “Quest” from a just-released EP of that same title. I’d heard the song once, on a drive out along the dry grasses and foothills of Colorado. It was on Seattle’s KEXP’s Iceland Airwaves 2017 pre-mix. I immediately marked the band on our Iceland Airwaves app itinerary. We have only a partial view of the stage. But it is this we traveled 3,586 miles to a tiny Nordic tiki bar for: The chords rise and pour and overtake. They rush over our black, porous, rocky edges. Tears start, but not tears. The song sears like blood coming back to numb fingers, but at the heart. Airwaves, Iceland’s annual fall music festival, started in an airport hanger in 1999. In its second decade, the festival now draws 7,000 fans to Reykjavik and other Icelandic venues to bathe in the soundscapes of over 220 solo artists, ensembles and bands from 30 different countries. Many are Icelandic, most Scandinavian, but artists from elsewhere in Europe, America and Australia are here, too. I hoped we would regain perspective from Iceland’s contrast. Focus on absorbing art instead of producing it. We would trade the relentless work schedule and harsh light of home—the kind that delineates every stalk of dried grass—for subdued hues, icy rain and the long blue-black night. There’s more light than I anticipated in November, at 66 degrees north. After checking into our hotel near the shipyard, we drop into a short “off venue” show at the Viking Brewery. A coarse, wet wind blows steadily under overcast skies. Inside the venue, two girls set up a keyboard, guitar and amps along a wall lit with a neon map of Iceland. They look no older than 16. “We are the band Between Mountains,” the girl with braces says as they start. They live in one of Iceland’s most extreme landscapes—the West Fjords. They are remarkably unselfconscious. They play straightforward songs that tap a clear musical sensibility passed down generation to generation—felt melodies—through Iceland’s centuries. This is a music festival for introverts. For the next three days, we will follow instinct from these small, “off venue” venues—where we listen with no more than a few dozen other fans in the lobbies of hotels or in breweries or warehouses—to the “official venue” halls of the Reykjavik Art Museum, small theaters, grimy punk and techno clubs, immaculate wooden churches, and the iridescent geometries of the waterside Harpa House. At Reykjavik’s KEX hostel, the five guitars and one drummer of Gler Akur (translate: “Glass Field”) perform a symphonic cacophony, “The Mountains Are Beautiful Now,” introduced by KEXP’s Kevin Cole (KEXP broadcasts from this room every year). Raw notes tear through air. I think I want Kevin Cole to DJ my funeral. Cole’s eclectic sets have carried me through long drives and workdays for years. In person, he’s nothing like his voice suggests. He’s tall, skinny, with a dark ponytail turned silvery-gray. He is from an era before smart phones and Youtube. DJing, like writing, is obscure, replaced by algorithms and playlists. But Cole knows: Raw notes like these don’t travel. Music is not a standalone phenomenon. It cannot be properly received without a ritual. Music is like weather. Gler Akur’s long, layered symphonic composition reveals the psyche where it is. Music gathers the scattered parts back into place, recalibrates us as the speedy thought-stream ceases—for a moment, just ceases. It’s said that everyone in Iceland has a job and “does” music. And yet Airwave’s music is as street-savvy as it is earthy, as pure pop and electronic as it is emotional, distorted, and gritty. We landed here in Keflavik in a rainstorm and another rainstorm delays our return. The airport, like Reykjavik, is on the edge of the North American tectonic plate, a black volcanic rock-scape in the North Atlantic Ocean, where forces are pulling the North American and Eurasian plates apart. On our last night at Airwaves, the knife-glinting techno beats—the sharp heartbeat of the Hurra club—mirror the moment to moment, pulsing (almost imperceptible) rage against the routine and demand waiting at home. In Iceland, we are still out of range. Icelanders are a small tribe. As the festival wanes the local Icelandic musicians—many of international fame—gather here, upstairs from Húrra in the grungy Gaukurinn: Hogni with long golden Viking hair but a voice like Cole Porter, face aglow with camaraderie and sweat from hot lights. There are the punk girls from the record shop—reticent without their props. And Between Mountains approached by a young video blogger or producer of sorts. Here are the last remaining festival faces, quivering to the devastating lyrics and piercing voice of Solveig Mattildur. Her voice liberates us from our roles: producers, DJs, journalists, fans, and artists. Just one girl and her synth. Her performance doesn’t need keeping or codifying. There are no selfies here, few phones held up to record. Her voice is simple and sublime. It is already complete. Iceland Airwaves runs November 7-10, 2018. 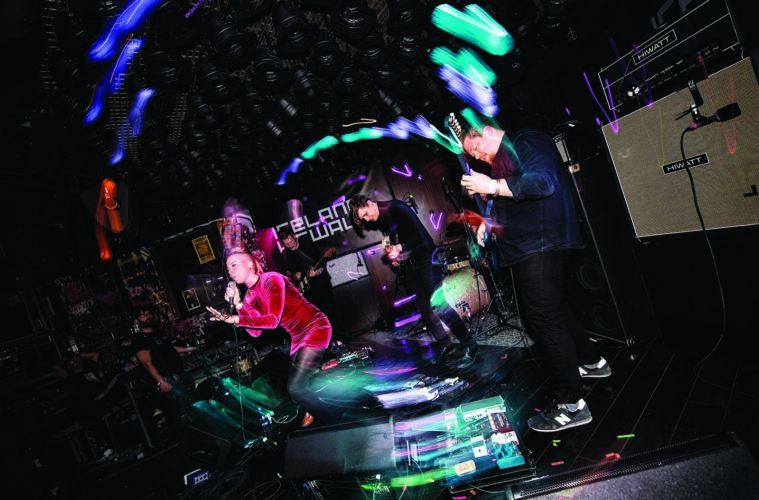 For information and lineups head to icelandairwaves.is. Hear previews and live broadcasts from KEX Hostel in Reykjavik on Seattle’s KEXP (kexp.org). Eat, Sleep, Play: Keystone, Colorado Arctic Dreams The October Issue is LIVE!